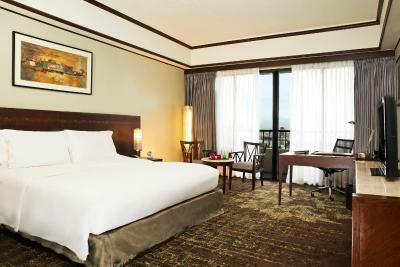 Lock in a great price for Sofitel Philippine Plaza Manila – rated 8.3 by recent guests! The room we stayed in was large and had great interior. The staff was very polite and attentive. The suite we stayed in also included several meals throughout the date that we didnt expect but very much appreciate. It was a great experience. The staff is great from the moment you checked-in to check-out. The pool is nice and the sunset view is amazing. The room is okay, the bed is super comfy and the bathroom is a bit dark, no light provision at the shower area. Make sure to close your balcony glass door properly every time you get in, since they have an AC temperature detection which is pretty cool. Location is very good, the breakfast was amazing all kind of foods from all around the world! The views of the pool and the sea are beautiful. The bed is the best thing they are very comfy. The highlight of our stay was the dinner buffet outside (Sunset Boulevard?). Not sure if I’m remembering the name correctly but it’s the buffet outside near the water. It was pretty much like a Hawaiian luau as there were traditional performers while you eat dinner. Totally worth it! The Spiral buffet was also really delicious. It’s a little pricey but we went for the experience and it was pretty good. The staff was excellent. I especially liked the courtyard/pool area. Overall is good aside from above mentioned in dislike section. Everything except JOHN with eyeglasses from the front desk. Sofitel Philippine Plaza Manila This rating is a reflection of how the property compares to the industry standard when it comes to price, facilities and services available. It's based on a self-evaluation by the property. Use this rating to help choose your stay! 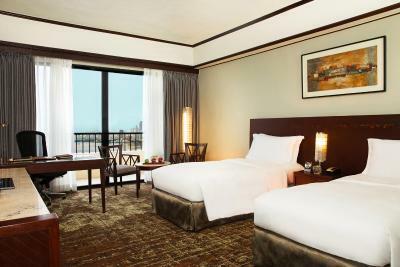 One of our top picks in Manila.Located in Pasay City, Sofitel Philippine Plaza Manila offers rooms with private balconies and views of Manila Bay. It features an outdoor pool, a spa, various restaurants and bars. Air-conditioned rooms are equipped with a cable TV, a personal safe, mini-bar and ironing facilities. Private bathrooms come with a hairdryer, bathtub and free toiletries. A 24-hour room service is available. Exercise options include a jogging trail, tennis courts and a fitness center. Guests can enjoy a pampering massage at Le SPA or relax at the spa pool and sauna. Other facilities include a grand ballroom and 14 meeting rooms. The hotel’s flagship restaurant, Spiral, features 21 dining ateliers that serve exquisite dishes prepared masterfully in the presence of guests. Drinks can be enjoyed at Le Veranda and Sunset Bar. Sports fan can catch up on the latest matches at Snaps Sports Bar. Sofitel Philippine Plaza Manila is located beside the Cultural Center of the Philippines Complex. It is less than 1.2 mi away from the Mall of Asia. 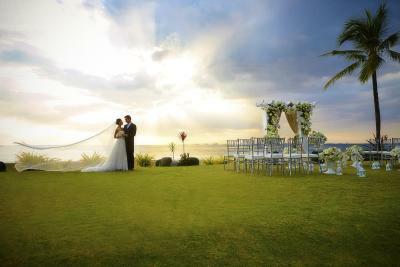 It is located about 4.3 mi away from Manila International Airport and a 30-minute drive from Makati City. Pasay is a great choice for travelers interested in food, restaurants and clothes shopping. 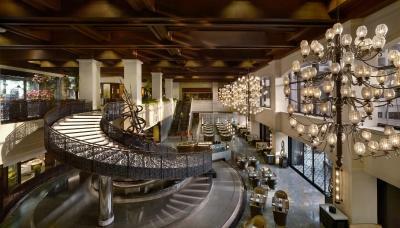 When would you like to stay at Sofitel Philippine Plaza Manila? Modern guest room with a balcony. A minibar, personal safe and air conditioning are included. Private bathroom has a shower. Spacious air-conditioned suite with views of Manila Bay or the pool. Includes a separate living area and a private bathroom. Corner suite features 2 balconies with panoramic views and a separate living room. Includes Club Lounge access and benefits. Sofitel Philippine Plaza Manila is an iconic 5-star luxury resort hotel located on Manila Bay, situated 12 minutes (6.9 KM) from the international airports. Also well located to the shopping area of Mall of Asia offering one of the worlds largest malls (2 KM) and also Intramuros (4.1 KM) which offers the Spanish historical area of Manila ideal for tourists. Makati is a 30-minute drive from the hotel and the hotel is surrounded by several convention centers. Hotel surroundings – This neighborhood is a great choice for travelers interested in food, restaurants and clothes shopping – Check location Great location - show map Guests loved walking around the neighborhood! House Rules Sofitel Philippine Plaza Manila takes special requests – add in the next step! Sofitel Philippine Plaza Manila accepts these cards and reserves the right to temporarily hold an amount prior to arrival. The living room was warm despite having the air-conditioning at the lowest setting and the the fridge could not cool anything. We tried to call the front desk about these issues, and they did send someone to our room, but the issues were not resolved. The pillows i believe were quite old already and saggy. There is no sign or tag for room cleaning/do not disturb. So our room was not tidy for 3 days. Toiletries not replaced daily unless i had to call for y Housekeeping. Staffs were accomodating esp at the front desk. my daughter loves the swimming pool.The food was superb with lots and lots of varieties. The hotel is outdated. TV didn't work, safe didn't work and the room felt very humid. The breakfast buffet was extraordinary. hard to find a parking space. the guard always advice that the parking is by chance only. Very long queue upon check in. Only 2 counters opened. When i suggested to add more, i did not get a straight answer. The staff is very kind and helpful. The pool is nice. The rooms are really clean. The food is very good. The shuttle to and from MOA was very handy. the location is great and near Manila Bay; the breakfast is great and having various options. The staff are fine. Ooops.The above statement should have been down this section. Every thing else excellent except the 10th floor snack room.Too busy and not spacious enough.The food options are redundant.Staff are kinda “choosy”.The elitist mentality existed and cater to.